Mae Ngat Dam in Sri Lanna National Park is situated in Chiang Mai province and is Thailand’s sixth largest National Park. The Sri Lanna National Park covers an area of some 1,406 square km’s and is bordered by Chiangdao district, Mae Tang and Phrao districts some 60km’sNorth of Chiang Mai. Mae Ngat Dam was formed by the flooding of a large valley which formed a large reservoir with numerous tributaries reaching out into the surrounding jungle. The lake is nestled between Mae Ngat and Mae Tang forest’s which are an abundance of wildlife, flora and fauna and covers an area of 1,281 square km’s. 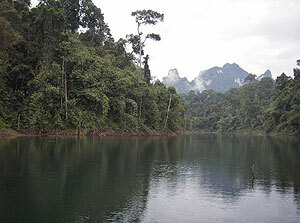 The surrounding jungles are a haven for various exotic and rarely seen wildlife and contain Wild Boar, Gibbons, Fishing Cats and Asian Black Bears. In addition several spectacular waterfalls are found in the neighbouring forests most notably Mon Hin Lai waterfall in the Mae Ngat Forest. The beautiful Mae Ngat Dam is an extremely scenic destination with numerous bays, tributaries and islands present in its boundaries. Twisted root systems lie submerged along its banks giving cover for aggressive Giant Snakehead and other native predatory species to lay in wait for their prey. 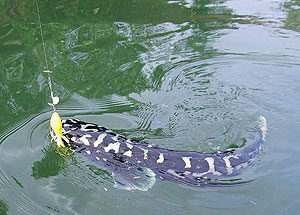 In addition this venue also contains various other species including Hampala Barb (Jungle Perch) and Rohu (Indian Carp). Traditional floating fishing rafts are located at various parts of the dam. These rafts serve as basic accommodation and as a base for your daily expeditions to different parts of the reservoir. 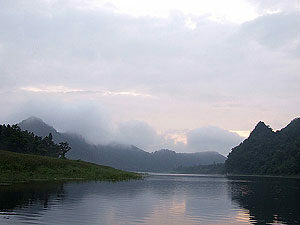 This highly scenic angling destination is best visited after heavy rains of July-September when water floods down from the surrounding mountains carrying all manner of insects and food items down to the lake and the Giant Snakehead partake in their annual spawning and birthing season.